Lullaby takes place in the Altairn Empire, where every person has their own sandman or sand maiden. The sand people remain in the Dream Realm, where they weave the humans beautiful dreams and try to keep the mares (creatures that cause nightmares) at bay. 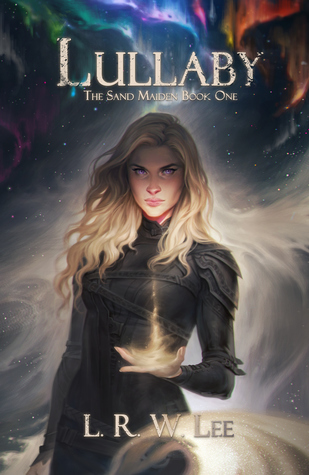 Alissandra is the sand maiden of Prince Kovis, and when he and his people are in danger, she must flee the Dream Realm to try to save his empire. The premise is really interesting, and throw in the fact that there are also sorcerers in Altairn, who can each wield up to three elements, this book sounds pretty amazing. If only it was as great as it sounded. One of the things I did enjoy about this book was the world. The magic system was very interesting to learn about, and the mythology was really interesting. I just wished it was explained further, but I do understand that this is going to be a series and L. R. W. Lee wants to save some of it for later. I was intrigued by the different elements the sorcerers could control, and I loved reading about the training sessions where Ali is learning more about the powers in this world. Unfortunately (I have a feeling that word will be used a lot in this review), a lot of the world was underdeveloped, and when you did learn new things, they were kinda just thrown in there randomly as a way to forward the plot, and not integrated early on or in a graceful manner. The characters in this book also felt underdeveloped. The only characters that really stood out as well rounded to me were Kovis’ siblings, Rasa and Kennan. They both had motivations for their actions, and while not always predictable, they made sense. Kennan especially, grew over the course of the book. As we learned more about him, we started to like him more and more (although some of his earlier actions were unforgivable). Kovis and Ali, however, had almost no character development and were somewhat infuriating as I read. I don’t need every female character to be strong and confident, but Ali’s lack of confidence was just annoying. I would forgive it if she slowly became more self-assured, but she really didn’t. There was one instance towards the end where I thought that maybe she had the potential to become someone interesting, but for the most part, I really didn’t like her. She had no personality besides her love for Kovis and her naivety, She was an immortal being, weaving the dreams of humans for lifetimes, but she acts like a toddler in a young woman’s body. I can understand it to some degree, but some of the things she claims to not know she seems to perfectly understand in the chapter before. Kovis, while having more of a backbone, was very much the broody love interest, and also lacked a distinctive personality besides that* (-GUYS SHE EDITED IT! KOVIS NOW HAS A HOBBY AND IM VERY HAPPY WITH THAT-). My biggest issue with this book was the writing style. While some paragraphs flowed well with prose fit for a fantasy novel, other times words were used that really took me out of the book*. For example, I can’t count how many times Ali “yipped” in this book*. There were a lot. And I found it really strange in a fantasy novel for a character to reply “nope” and “yep”*. It just seemed weird enough that I couldn’t suspend my disbelief. Also, the pacing was off for me. While I was glad the events of the book didn’t take place in one week, I felt a lot of the plot was just filler. By the time the characters introduced what would be the climax*(-now it is introduced slightly earlier-), I thought they were just setting up for the sequel because there was no way they would force this huge event in only fifty pages left. For the first couple hundred pages or so, nothing happened. And while I get that this book focuses more on the romance, there wasn’t even much happening there. By the time things start happening, there are only a hundred pages of the book left and they just began the actual plot. Cons– The characters were lacking, the writing style switched from NA fantasy to your typical fanfiction*, and the darker aspects were brushed over and handled poorly. If I had to describe this book in one word, it would be underdeveloped. The characters, the setting, the writing, it all felt underdeveloped. It was as if this was merely a manuscript that is still undergoing the editing process.